We found some postcards pushed through our letterbox the other day, with this picture on it. 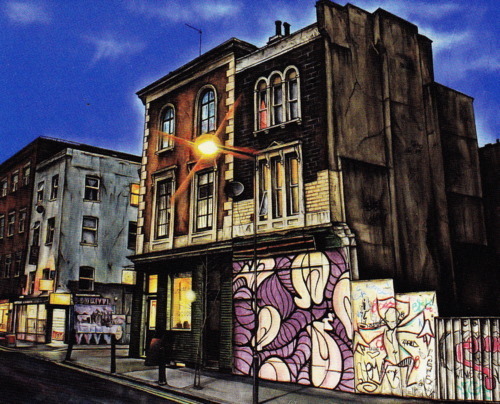 The artist is Marc Gooderham, who ‘captures the decaying still-lifes of a forgotten London.’ Well I hope we’re not that forgotten, but its interesting to see the old Georgian building next to our shop, which for many years was a squat, and which was demolished to make way for another new block of flats. No doubt offering exclusive urban living with a touch of Shoreditch edge. The artist’s website is marcgooderham.co.uk.